This is one of the oldest Khukuri made in Nepal, and also one of the traditional Khukuris. The blade is 14 inch long and it is handmade unpolished blade. It is a full tang Khukuri with the handle about 6 inch long. The handle is made up of Rosewood and Bone, which is glued together by Laha and 4 rivets are used to tighten up the tang. Another unique feature of this blade is that the base of the blade or Chhapri is made by wood fused together with bone, which is done for the first time launched by FGHk .Unique to our shop, this is a custom remake product of our shop. The materials used in the blade are Highly graded carbon steel 5160. The scabbard is made up of refined buffalo leather along with pinewood which are fused together.The spine is 8mm and widest part of the blade is 6.2 cm. The total weight of the Khukuri along with Scabbard is 1400 grams. 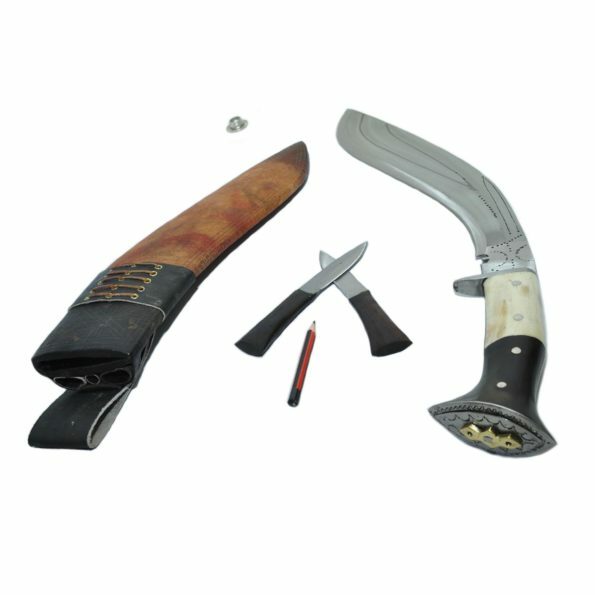 A set of Chammak and Kharda comes with the Khukuri, which are small accessory blades used for sharpening the blade..
Blade Size and Type: 14 inch Handmade Unpolished blade. Handle Size: 6 inch Full Tang Rosewood and bone handle. 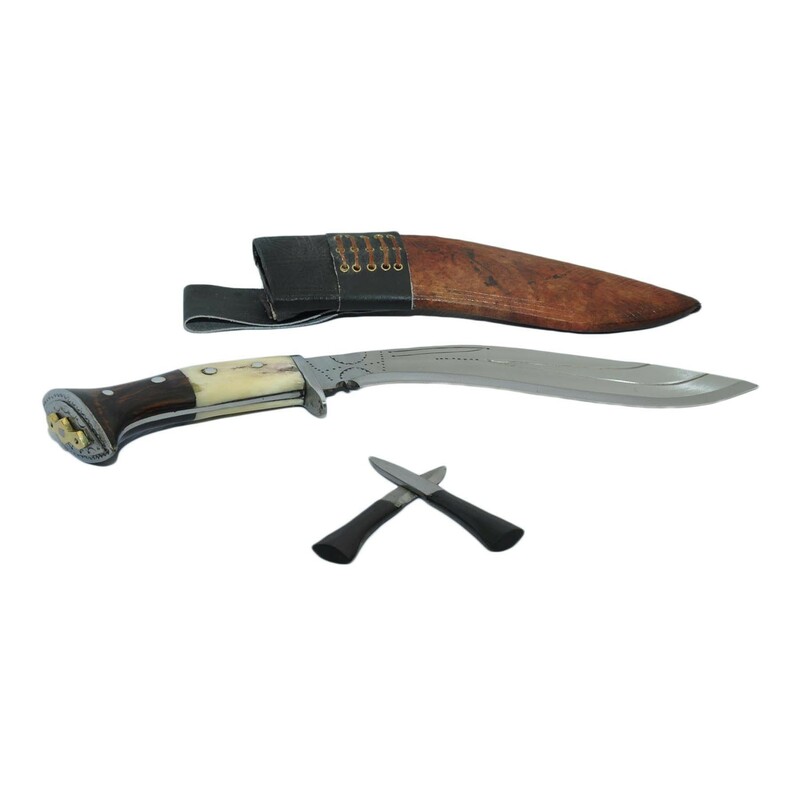 Material Used: Highly Graded Carbon Steel 5160, Refine Buffalo Leather for Scabbard(outside) and Indian Rosewood for the Handle, Pinewood for the Scabbard (inside), White metal and “Laha” ( Nepali Traditional Glue) .